I got the recipe from a book called 1001 Cupcakes, cookies & Other Tempting Treats. I got the book from Barnes & Noble couple of months back and finally started trying few goodies from it. The original recipe is made with Museli. I replaced Honey Bunches of oats for Museli. 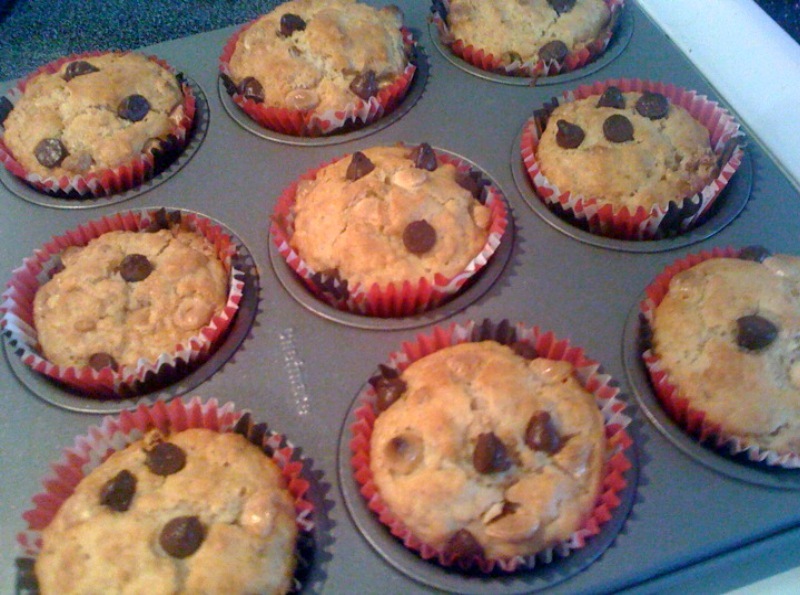 It came super good and I added few chocolate chips in each muffin. Here goes the recipe. Pre heat oven to 400 degrees. Line a 12 hole muffin pan with paper lines or spray it and keep it ready. Sift together the flour and baking powder into a large bowl. Stir the cereal and sugar. Place the eggs in a large pitcher and beat lightly. Then beat in the buttermilk and oil. Make a well in the center of the dry ingredients and pour in the beaten liquid. Stir gently until just combined. Spoon the batter into paper liners. Sprinkle chocolate chips. Bake in preheated oven for 20 minutes, or until well risen, golden brown. Let it cool for 5 minutes and serve warm. 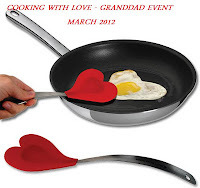 I am sending this post to Cooking with Love - Granddad Event, hosted by Shama. 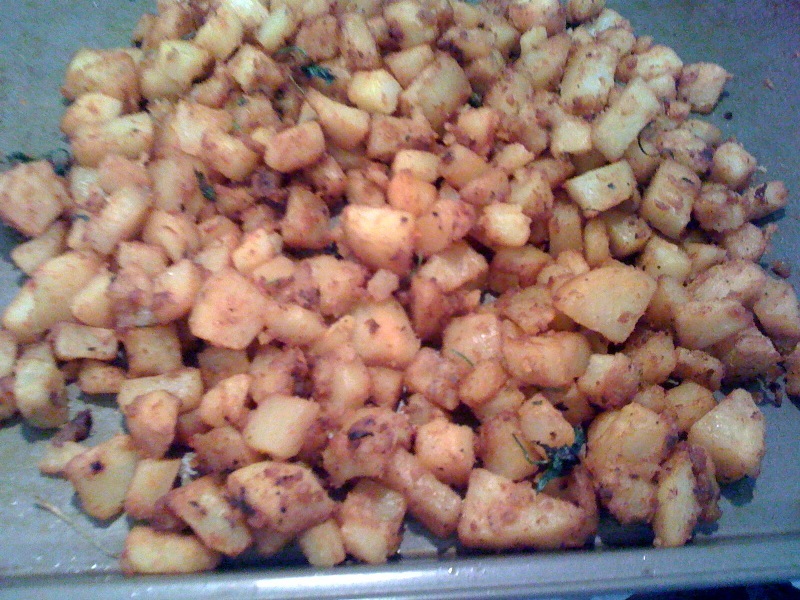 This is a baked version of potato curry. I was going through my cousin's blog En Vittu Virundhu, I came across this baked potato curry with garlic. But I skipped the garlic. Her version was fully baked and mine is half baked & half stove top cooked. Here goes the recipe. Take a microwave safe bowl. Put small holes in potato with a fork. Add required amount of water to cover the potato and microwave it for 5 to 7 minutes or till it is half cooked. Let it cool. Peel it and cut it into small cubes. Now put the potato pieces in a ziploc cover adding required amount of salt, turmeric powder & red chillies powder and shake it nicely so that the dry ingredients get coated in the potato pieces. Pre heat oven to 350 degrees. Now take a cookie sheet. 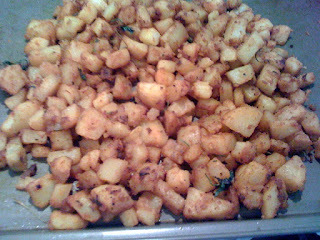 Spray the oil nicely and spread the potato pieces. Cook it for 5 minutes in the 350 pre heated oven. Stir it in between. Take out the curry when you get the expected crispy structure.